The Club Family Hotel Beaurivage, 3 stars superior with direct access to a private beach is ideal for holidays with children. It has a large outdoor pool with water slide, mini club, entertainment, parking and WI-FI. Accepts free of small pets and medium size. 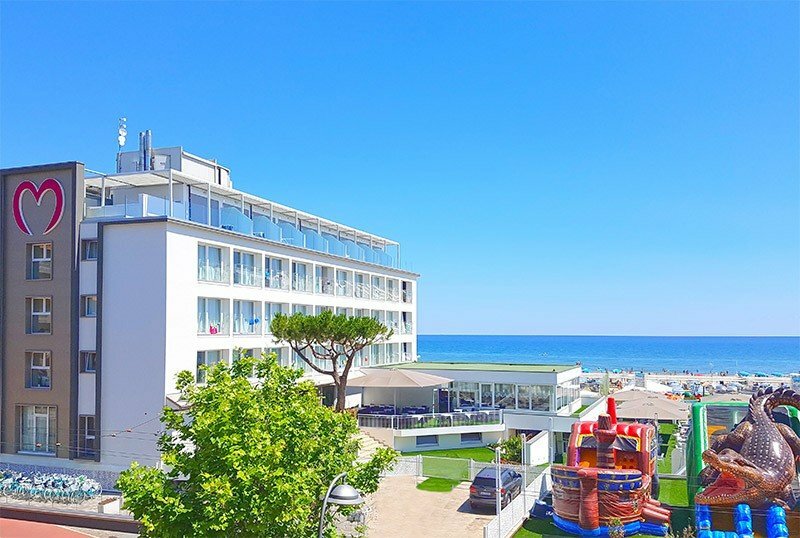 The hotel is located in Riccione in the Marano area directly on the beach: Access is direct with no roads to cross. In front there is the stop of bus no. 11, linking Rimini to Riccione with frequent departures. The hotel is distinguished by the breadth of its outdoor spaces, adjacent to a private beach. Here you will find: a large swimming pool with water slide, sun terrace with sun loungers, a tennis court, a garden with children's play area, two large parking lots, 50 free bicycles. For all guests at disposal: open bar 24 hours a day at the hotel and on the beach, children's facilities, disabled facilities, WI-FI access, night porter, free beach towel, lift, welcome drink, luggage storage, air conditioning and heating. We organize weekly theme nights for adults and children, conventions are available in the pool, the water slide and amusement parks. The hotel accepts pets free of small and medium size, which can reach the beach in a dedicated area. All rooms were renovated in 2013 and feature balconies with sea views, air conditioning, bathroom with glass-enclosed shower and a hairdryer, WI-FI, satellite TV, minibar, safe and telephone. Connecting rooms are available with two bathrooms, two balconies and a single input. Breakfast is sweet and savory buffet with homemade pastries, yogurt, cereals, jams, croissants, fruit, cold cuts and fresh bread. The kitchen offers lunch and dinner choice of 3 menus meat and fish, cooked according to the best local tradition, accompanied by a buffet of appetizers and vegetables. baby menu available, baby food and kitchen for the mothers. Pasta and desserts are homemade. 2 children up to 15 years in room with 2 adults throughout the summer do not pay.